Wear neutral coloured clothing and put on gold earrings and a necklace and observe yourself in the mirror. Make sure to do this in natural day light as the tones of artificial light can influence your inferences. Next, repeat this process while wearing silver jewellery. Which one suited you better? Chances are that warm toned people tend to pick gold jewellery while silver trinkets compliment cool tones! You probably got your answer if you could make out your skin’s undertone with this test but if not, check it with the second test! Think back to all those times when you were out in the sun for several hours. Did your skin tan (turn darker) or burn (turn red)? Warm tones tend to get tanned while cool tones are very susceptible to sunburns. The most famous test to check skin’s undertone – the veins test! Look at the veins on your wrist under bright natural light. Do they appear blue/purple or green? If your veins seem to be coloured in hues of greens you are most likely a warm tone, and if you see shades of blue and purple, you are cool. If your answers for all the three questions were inconclusive or somewhere in the middle, then you can classify yourself as a neutral skin tone. 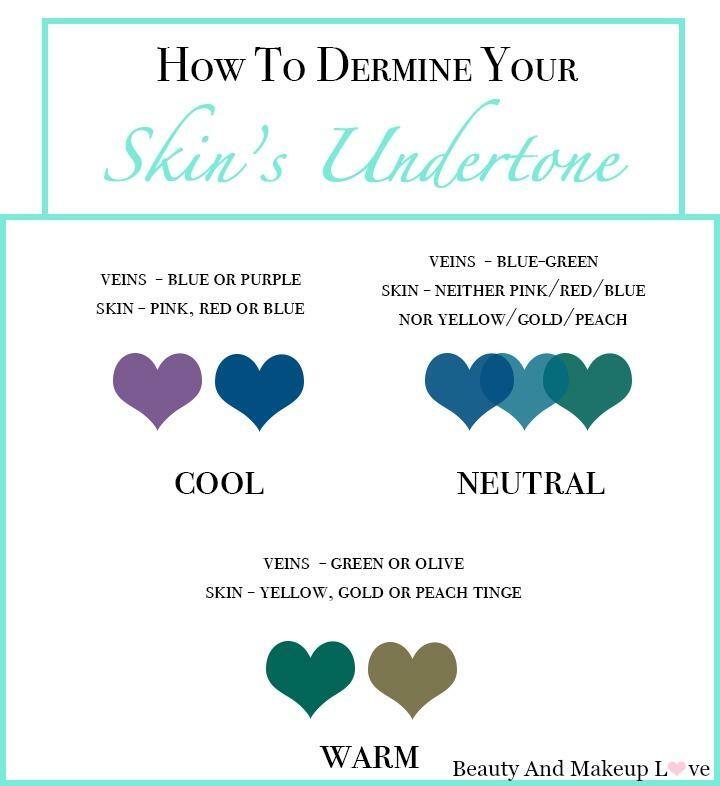 Now that you’ve determined your correct undertone, it is time to understand what colors would work better for you! Warm toned women rock earthy hues like olive-green, brown, mustard, red and orange. Sun kissed coral and creamy peach tones work perfectly for the summer months. When it comes to jewellery, you should flaunt pieces in copper, bronze and gold. Foundations with yellow tints would blend well into your skin, and you should choose green, brown or pink eye shadows with a golden hue. Lipsticks in warm reds, pinks, and browns should be your go to shades! Cool toned women look ravishing in bold jewel tones such as blues, purples and emerald-green. For a softer look, you can choose subtle pastels like lavender and powder blue. While choosing jewellery, pick up white metals like silver and platinum. Foundations with pink tones would help you create a seamless complexion and the right eye shadows for you would be blues, silvers and cool greys. Your go to lip colours would be glossy light pinks and purples! Lucky are the women with neutral undertone as they can pick up any shade and look their best in it and same goes for foundation, they can pick up a foundation with any of the undertones (either pink undertone or a yellow undertone or a mix of both the undertones), everything goes well with the NEUTRAL undertone! Your guide to what color looks best on you can be determined from this easy chart! Warm skin tones do not automatically mean dark skin or vice-versa. If you are neutral, then you have features of both types and would be able to determine your ideal colour palate through hit and trial. These rules are not iron-clad and you should wear what you feel the best in! Previous Previous post: Best Body Spray Sunblocks in India: The Waterproof Edit! Next Next post: BB Cream vs. CC Cream: What’s The Difference?